One of the reasons why I’m such a huge proponent of yoga for runners is that it’s a great way to help prevent running injuries. You get a ton of benefits in one workout, and you’re much less likely to get sidelined by an injury with a consistent yoga practice. 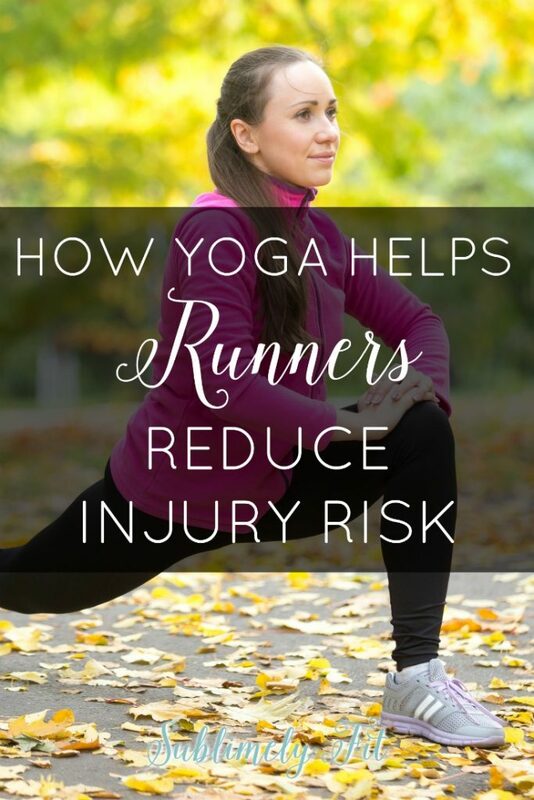 But why exactly does yoga help reduce your injury risk as a runner? There are three main reasons: it builds strength, it helps improve your range of motion, and it helps you listen to your body. Having a strong body can help prevent running injuries. Strong muscles help you run with good form, and they help support your body against the shock of your feet hitting the pavement. A yoga practice is great for building strength, and you’d be surprised by how strong you can get just by using your body weight. You can strengthen your feet and ankles, legs, hips, core, and upper body with yoga. It’s definitely a total body workout! Many running injuries can be traced to weaknesses, especially in the hips. Weak hip stabilizers lead to uneven hips, which can easily lead to injury. I’ve experienced this first hand: my weak hips and glutes lead to a bad hip flexor injury that made me DNF at the Chicago Marathon in 2012 despite being in the best shape of my life. A well-rounded yoga practice will help you strengthen those hip stabilizers, helping you stay injury-free. A yoga practice will help you become more flexible, which helps you improve your range of motion. When we run, we’re working the running muscles in our legs and hips. Working out causes tiny microscopic tears in our muscles as we work to get faster or run longer. After the run, our muscles heal and become stronger, but they also tend to heal in a shortened state. As a result, runners tend to be relatively inflexible, especially in their hips and hamstrings. A better range of motion helps reduce your risk of getting injured as a runner. And, poor range of motion has been shown to lead to injury in other athletes, too. If your hips are too tight, your running form suffers. You may move your legs in slightly odd ways, or you can land with each step in an inefficient way. Over time, the poor running form caused by your tight hips leads to an injury. A consistent yoga practice will help you build flexibility, which will help you maintain a good range of motion throughout your lower body. Even spending 15 or 20 minutes on your yoga mat three times a week can help you get the flexibility you need to keep injuries at bay. One of the biggest reasons runners get a full-blown injury is they ignore the signs their bodies send them. Your knee might give you consistent little twinges before the problem progresses into runner’s knee. You might feel a little discomfort in the outside of your knee or thigh for several days before IT band syndrome develops. Often we have warning signs that an injury is going to happen, but we ignore them. We spend a lot of time totally disconnected from our bodies. We stare at screens all day and all night. Then, when we’re running, we’re thinking about our to-do lists or a conversation we had with our boss, not what we’re feeling when we’re running. That dissociation can be helpful in some instances—it keeps you from getting bored on long runs, for example. But when you let your mind wander so much that you’re no longer paying attention to your body, that can get you into trouble. Yoga teaches us to be in tune with our bodies. We work to quiet our minds and exist in the present moment, focusing on our breath and the sensations we feel. You feel the strength of Warrior II as you feel your shoulders be firm and your quads support your lunge. When you cultivate that mind-body connection in your yoga practice, you can take what you learn off your mat and use it when you run. You’ll notice those twinges and you’ll be able to take a rest day, get new shoes, or head to your doctor before it becomes an even bigger issue. 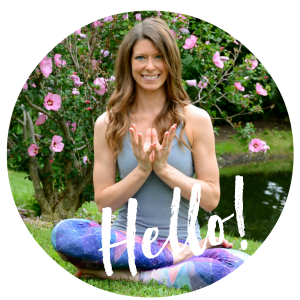 I hope I’ve convinced you that a yoga practice can really bring a big improvement to your running! 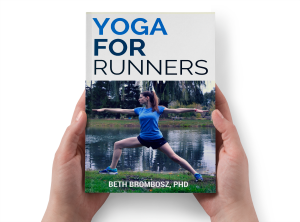 If you’d like to learn more about adding yoga to your running, sign up for my free week-long Yoga for Runners Challenge. You’ll learn some great yoga poses that will help you become a stronger, more injury-resistant runner! You know very well that I couldn’t agree more! I’m going to have a whale of a time get back to running (AGAIN) after this hiatus, with no yoga or running for a month! You convinced my a long time ago that I need to make Yoga a standard in my workout routine, and this year I’m determined to include it! Yes, girl! With all the running you do, I think it will really help! I haven’t been including yoga as much as I should, but I really appreciate those moments when I am able to tune into my body. I love this. I feel like everyone is talking about hips and glutes this week! And those are my problem areas! 😉 I skipped yoga this week but maybe I’ll add it in tomorrow after my run instead of waiting until Sunday.